On June 10th, BridgeWell Capital received a loan proposal from one of our best investors. 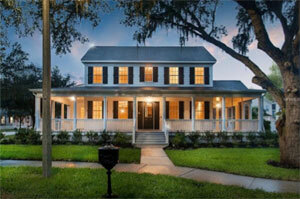 They were looking for a private money loan for an investment property in Celebration, Florida. The property, a 2-story, 90’s contemporary with a lot of, has 4 bedrooms, 2 baths, and over 2,000sq. ft. of possibilities. Built in 2003, the investment property is located within minutes of numerous shopping and dining options. It’s close proximity to Interstate 295 makes commuting into the city or shore a breeze. The investor’s plan was to buy it, fix it, and flip it. The property was purchased at $108,000 in “as is” condition, and while the property was in good structural shape, the interior was in the middle of being remodeled when it was sold, so the bathrooms, kitchens, and flooring would have to be done. The estimated cost of rehab came in at $15,000. At BridgeWell Capital, funding real estate investments is what we do, and we do it well. In this case, we worked with our client and developed a loan program that covered 90% of the total project cost, including rehab, meaning our client only had to come up with 10% down, leaving them with more money to spend on the more important things in life, like friends and family. With the funds in place, BridgeWell Capital’s client was able to close on the property and get started on the rehab immediately. After the renovations were completed, an appraiser valued the house at $163,000, netting our investor a profit of almost $30,000.